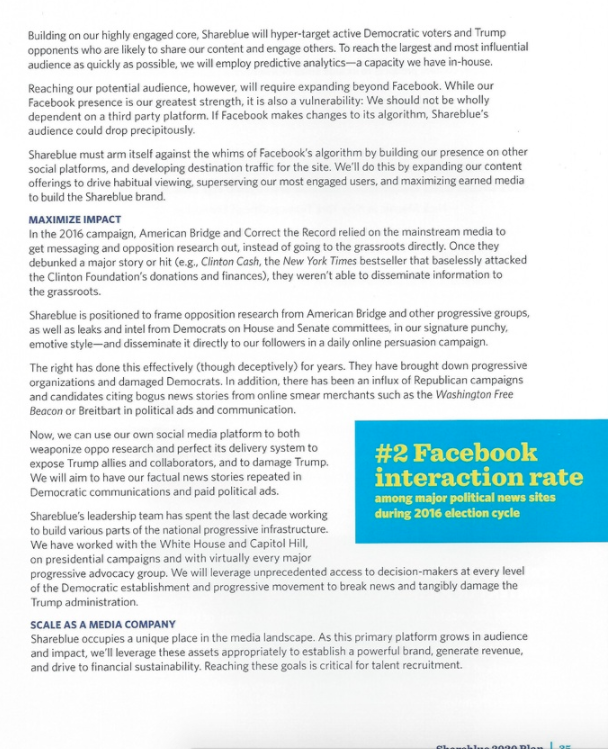 A new document, titled “Democracy Matters: Strategic Plan for Action”, was discovered recently that reveals a liberal coalition of business entities and groups and their plans to influence the media and the general public for the 2017-2020 period featuring everything from Russian-conspiracy jargon to anti-Trump dictums. 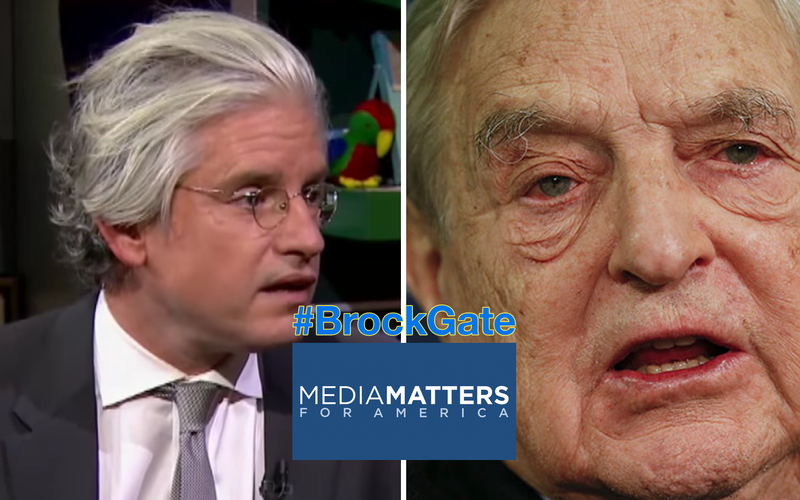 The four entities are as follows: Media Matters for America, American Bridge, CREW, and Shareblue. Each has their own strategic plan. You can view the full document below, or in our archive. 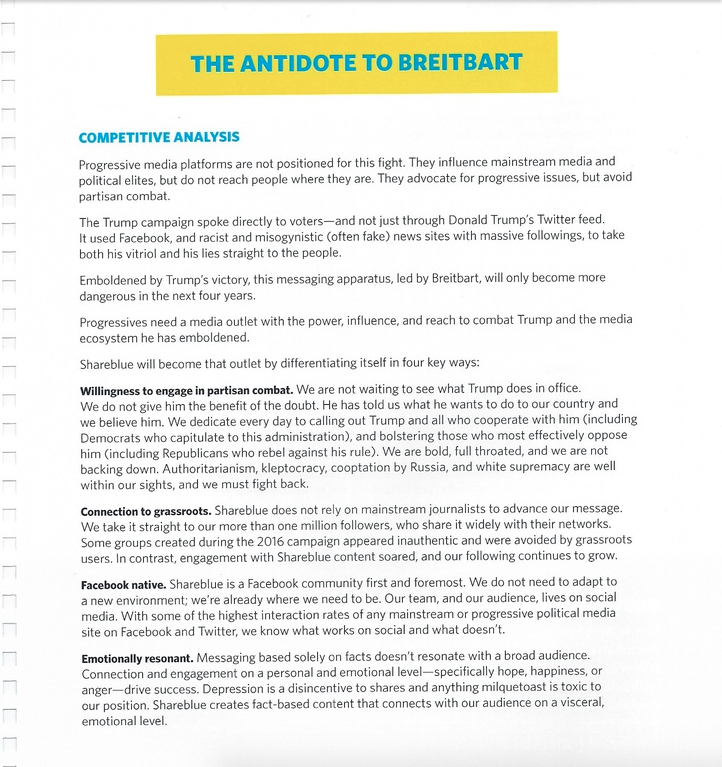 One of the more startling sections of the #BrockGate Media Matters document is the Shareblue portion wherein they outline their proposed “Antidote to Breitbart” and Shareblue’s “overarching strategy”. In this, their personal strategy document, they are talking about RUSSIA. Russia is part of their strategy, calling President Trump a white supremacist is part of their strategy, stressing the fact that he is authoritarian is part of their strategy. These are baseless attacks. 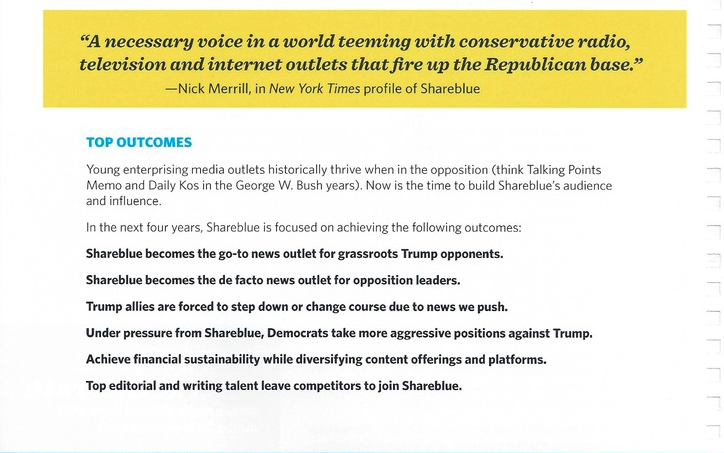 Shareblue becomes the go-to news outlet for grassroots Trump opponents. Shareblue becomes the de facto news outlet for opposition leaders. Trump allies are forced to step down or change course due to news we push. Under pressure from Shareblue, Democrats take more aggressive positions against Trump. Achieve financial sustainability while diversifying content offerings and platforms. 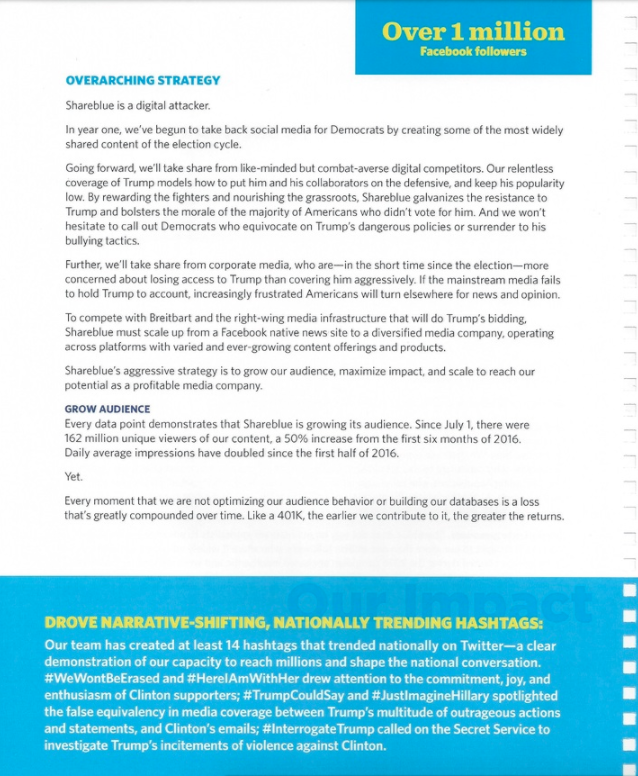 In the document, the group claims that they will push the Russia narrative forward, they assert that they will steal the best talent from the other left-wing outlets and consolidate them into Shareblue (they will convince “top editorial and writing talent [to] leave competitors to join Shareblue”), they propose a paid “Twitter-like” social network for the “opposition” to collude, they discuss their “Antidote to Breitbart” and their goal of controlling platforms like Google and Facebook, and they also mention a “Trump War Room” and their goal of keeping President Trump “unpopular” and how they are actively trying to portray President Trump as a “weak, think-skinned [sic] ‘loser’ vulnerable to goading”. In all, this is a comprehensive three-year game plan that the left hopes to implement to great effect in their effort to win votes in 2018 and take the White House in 2020. You can read TGP’s two previous reports on #BrockGate here and here and here.